Medical expenses are the largest cause driving people to declare personal bankruptcies in the US. Filings have dropped 50 percent, from 1,536,799 in 2010 to 770,846 in 2016. Those years represent the time frame when the ACA took effect. Bankruptcy and legal experts agree that medical bills had been a leading cause of personal bankruptcy. Unlike other causes of debt, medical bills are often unexpected, involuntary, and large. Filings have dropped about 50 percent, from 1,536,799 in 2010 to 770,846 in 2016 (see chart, above). Those years also represent the time frame when the ACA took effect. Although courts never ask people to declare why they’re filing, many bankruptcy and legal experts agree that medical bills had been a leading cause of personal bankruptcy before public healthcare coverage expanded under the ACA. Unlike other causes of debt, medical bills are often unexpected, involuntary, and large. “If you’re uninsured or underinsured, you can run up a huge debt in a short period of time,” says Lois Lupica, a bankruptcy expert and Maine Law Foundation Professor of Law at the University of Maine School of Law. 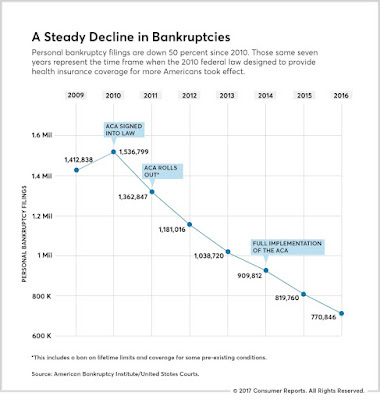 So did the rise of the ACA—which helped some 20 million more Americans get health insurance—cause the decline in bankruptcies? The many experts we interviewed also pointed to two other contributing factors: an improving economy and changes to bankruptcy laws in 2005 that made it more difficult and costly to file. However, they almost all agreed that expanded health coverage played a major role in the marked, recent decline. Some of the most important financial protections of the ACA apply to all consumers, whether they get their coverage through ACA exchanges or the private insurance marketplace. These provisions include mandated coverage for pre-existing conditions and, on most covered benefits, an end to annual and lifetime coverage caps. Aspects of the law, including provisions for young people to be covered by a family policy until age 26, went into effect in 2010 and 2011, before the full rollout of the ACA in 2014. The first attempt to repeal and replace the ACA, in March, failed to gain enough Congressional support and never came to a vote. Then in April, details of a new replacement plan were released. Although President Donald Trump has said that this new version, like the first bill that was pulled from consideration, will cover pre-existing conditions, the revised law gives states broad latitude to allow insurance companies to increase rates for consumers with an existing illness. Since the start of the year, more than 2,000 consumers have answered an online questionnaire from Consumer Reports’ advocacy and mobilization team, sharing their experiences with the ACA. Katie Weber of Seattle was one of them. In 2011, she had just landed her first job out of college, as a teacher with AmeriCorps, she explains in a phone interview. That’s when the unusual numbness in her hand began, which she—and her doctor—at first mistook for a pinched nerve. Then came debilitating headaches and nausea and, ultimately, a diagnosis of medulloblastoma, a fast-growing cancerous brain tumor. The treatment for her tumor was straightforward: surgery, radiation, then chemotherapy. Figuring out how to pay for it was much less clear. She worried that the insurance she had through AmeriCorps wouldn’t cover enough of her bills. “My dad said to me, ‘Your health is the most important thing. If you have to declare bankruptcy at age 23, it’s no big deal,’” Weber says. Because of the ACA, she says, it never came to that. After her year with AmeriCorps, the new healthcare law enabled her to get coverage under her parents’ insurance plan. The ACA provisions required that the family’s insurance company cover her even though she had already been diagnosed with cancer. That would not have been the case before the ACA, which mandates the coverage of pre-existing conditions for all consumers. Later, when she aged out of her parents’ insurance, Weber was able to enroll in Apple Health, Washington state’s version of Medicaid, a program that was expanded once the ACA was passed. That coverage, she says, has been crucial to her financial and medical well-being, especially once the cancer returned last fall. Weber says she now spends more time discussing treatment options and less time worrying how she’ll pay for MRIs and drugs. These are covered in full under her Apple Health policy. If you want further testimony about how much personal bankruptcies have dropped over the past decade, talk to Susan Grossberg, a Springfield, Mass., attorney. With the advent of the ACA—and before that, expanded state healthcare in Massachusetts—she says fewer clients with large medical debts walked through her door. Grossberg adds that her bankruptcy business has slowed so much that she has been forced to take on other kinds of legal work—landlord-tenant and housing discrimination cases—to cover her own bills. The American Bankruptcy Institute suggested that veteran Chicago bankruptcy attorney and trustee David Leibowitz could also help parse the reasons for the decadelong decline. First, he says, the Bankruptcy Abuse Prevention and Consumer Protection Act of 2005 made it more difficult for consumers to file for bankruptcy. The law required credit counseling and income verification and forced many consumers to seek protection under Chapter 13, which restructures, but does not eliminate, most debt. The piles of paperwork also meant most filers needed a lawyer, which made bankruptcy more costly and therefore not an option for many poor consumers. Then there was the economy. After a slow and steady recovery following the housing crisis of 2008, Leibowitz explains that American consumers generally had fewer problems with their mortgages, better employment prospects, and greater access to credit, which made them less likely to file. The final factor, according to Leibowitz, has been the ACA, which afforded health coverage to many more consumers and expanded protections for all. Of course, not everyone sees such a direct connection between the decline in bankruptcies and the emergence of the ACA. Thomas P. Miller, resident fellow at the American Enterprise Institute and co-author of “Why ObamaCare is Wrong for America” (HarperCollins, 2011), cautioned against “reaching broad conclusions” because the subject is so complex. Over the past decade, determining the cause-and-effect relationship between medical debt and bankruptcy has become a political football, particularly during the years the Obama administration was trying to pass the ACA through Congress. The truth is that it’s not that easy to determine how many bankruptcies are caused by medical debt. Examining the paperwork doesn’t always offer insight because debtors often juggle their indebtedness, for example, using a credit card to pay an outstanding medical bill while leaving other debts unpaid. But a 2014 study from Daniel Austin, a bankruptcy attorney and, at the time, a professor at the Northeastern University School of Law, offers some of the most in-depth research to date. His team’s research found that medical debt is the single largest factor in personal bankruptcy. First, Austin analyzed the paperwork of individual case files, which suggested that medical bills were a factor in 18 percent of filings. But when he directly asked the same filers, in a survey, the number was even higher, with 25 percent citing medical bills as a factor in their decision to file bankruptcy. In addition to the nationwide group, Austin isolated a group of 100 bankruptcy filers from Massachusetts. Why Massachusetts? Because its citizens, starting in 2006, had been covered by a comprehensive state healthcare program similar to the ACA known as Romneycare, after the state’s former governor, Mitt Romney. The differences between the two groups were striking. Even though the Massachusetts filers owed substantially more in unsecured debt (that is, debt not backed by a home, a car, or another asset) than their counterparts in other states, they reported less than half as much medical debt, which is also unsecured. “The average medical debt in Massachusetts in 2013 was relatively low at just $3,041 (6 percent of total unsecured debt) compared to $8,594 (20 percent of total unsecured debt) nationwide,” Austin writes in his 2014 study, portions of which were published in the Maine Law Review. “Only about 9 percent of Massachusetts debtors felt their bankruptcy filing was a result of medical bills,” Austin explains. “This compares to 25 percent for debtors from [other] jurisdictions.” Austin’s research found that comprehensive medical coverage in Massachusetts had all but eliminated medical bills as a cause for bankruptcy. “Not only in absolute numbers—they had much smaller medical debt—but psychologically, medical debt did not loom nearly as large for people in Massachusetts as it did for other people in other states.” And in 2010, four years after Romneycare began, the state had a bankruptcy rate that was about 30 percent lower than that of other states. At its most basic level, health insurance allows consumers to pay for the medical care they need. Each year, the Centers for Disease Control and Prevention determines how well the system is working by surveying Americans and asking a simple but powerful question: Did you have problems paying medical bills in the last 12 months? The percentage of those reporting problems has dropped from 21.3 percent of households when they first asked the question in 2011 to 16.2 percent in 2016. That’s almost 13 million fewer Americans no longer facing collection notices from a doctor or hospital. “It’s been happening across the board, by race, by age, by insurance status, by gender,” says Robin Cohen, the study’s lead author. But insurance is also about peace of mind. And judging from the consumers who have shared their stories with Consumer Reports, that certainty is in short supply as the fate of the ACA is decided. People are wondering what comes next: Repeal? Replace? Improve? Retain and neglect? No one really knows the answer. Americans are concerned about how the future of healthcare will affect them and their families. In CR’s Consumer Voices survey in January 2017, 55 percent of consumers said they lacked confidence that they or their loved ones would be able to afford insurance to secure that care. Don Shope of Ocean View, Del., said the availability of ACA coverage gave him the confidence to leave a corporate job and start his own consulting business. But now, with the ACA’s future in limbo, he and his wife are watching the action in Washington and worrying that they might have to return to jobs with benefits. And then there’s Kristin Couch, who has channeled the uncertainty into her own brand of activism. “I was kind of anxious,” Couch says about the day in March when Congress was set to vote on a less robust bill that would replace the ACA. The 31-year-old public relations executive, of Gainesville, Ga., has started to follow health-care politics in the intense, almost obsessive way some people follow sports. The morning after Election Day, she called the offices of her local congressional representatives, urging them to preserve the protections the ACA offers. Couch began caring about healthcare as a high school senior when she was diagnosed with lupus and since then has become something of a reluctant expert on how to manage not only her treatment but also the insurance that pays for it. With friends and neighbors she talks about the law in simple but personal terms. “I tell people, ‘I have a pre-existing condition, and this has helped me,’” she says of the ACA. Couch follows the healthcare debate in Washington so closely because she knows firsthand what happens when you don’t have adequate coverage. Couch remembers the time, before the ACA, when a new immunosuppressive drug that wasn’t covered by her policy became available. “It was expensive,” she explained in an interview, “but it worked, and I knew I needed it. Every month I’d just put it on a credit card. When your medication is thousands of dollars a month, that’s the start of being in debt.” She considered bankruptcy but ultimately worked her way out from under the pile of medical bills. As a result of the ACA, her coverage shifted again when her employer no longer offered a traditional plan and she had to switch to one with a high $3,000 deductible. Initially she was stunned by her out-of-pocket costs, but she quickly realized that her total costs would be capped once she’d met that threshold.